I recently got my Lerners for MR (meduim rigid) truck licence. 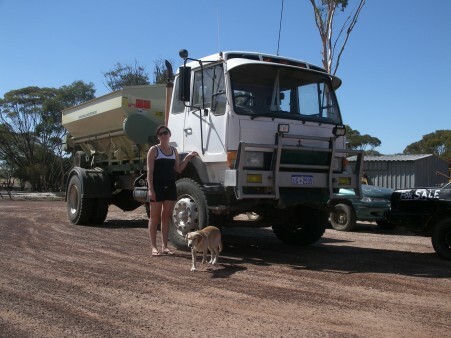 So now I am driving my dad’s spreader truck when I can before I have to do my driving test. The plan is to move up to the next level so I will be able to drive one of my dad’s bigger trucks during harvest when he gets busy. This truck is nice and easy to drive, so at the moment its all fun. Today, after a drive, I tilted up the cab and filled up the radiator with water after the light came on (My dad will be so proud that I remembered how to do it!! lol) I had my 5yr son who helped undo the bolts on the bull bar, so hopefully he can learn to look after his vehicles too.